Every year, Mooseheart students recognize Memorial Day on the Friday before the holiday weekend. This year’s ceremony took place Friday (May 25.) 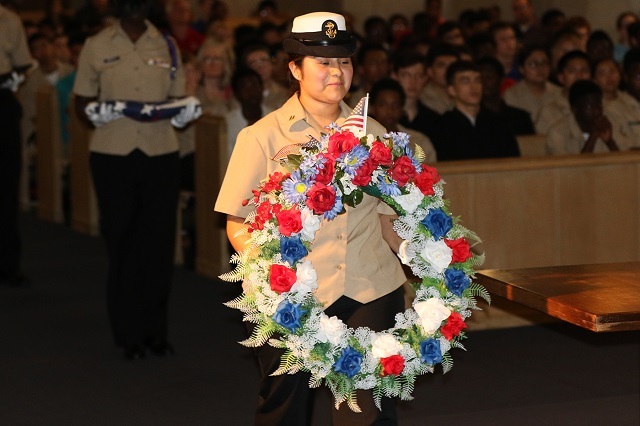 All Mooseheart High School students are participants in the school’s Naval Junior Reserve Officer’s Training Corps (NJROTC) unit, which conducts the program at the House of God. Central to the service, which honors fallen U.S. service members with readings, poems and videos, is the placement of a wreath on the House of God altar. This year, junior Britney Tovar placed the wreath. Following the ceremony, NJROTC cadets joined Mooseheart staff and others who attended the service in a silent walk through the campus’ Flag Walk, which consists of flags placed in honor of the military service of Moose members, relatives of Moose members and Mooseheart graduates. NJROTC Commanding Officer Amanda Jones led the procession through the Flag Walk.